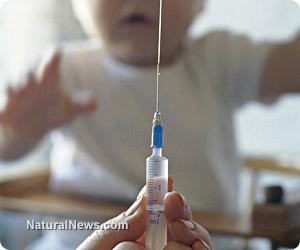 (NaturalNews) The controversy regarding the continued use of mercury in some vaccines, despite the element's proven toxicity, is coming to a head as the United Nations (UN) considers the passage of a new treaty that would outlaw the use of mercury in medicines worldwide. According to a recent report compiled by consumer advocate Tim Bolen, the vaccine industry is in a panic over this impending ban, as it could spell the end of the vaccine industry as we know it. Even though Thimerosal, a mercury-based preservative that has been used in vaccines since the 1930s, is said to have been largely phased out of most vaccines, particularly those intended for young children, many vaccines, including the flu vaccine, still contain it. This means that millions of children are still being injected with a known neurotoxin that for no legitimate reason continues to be used in the production of vaccines for the convenience of the vaccine industry. So at the fifth session of the Intergovernmental Negotiating Committee to prepare a global legally binding instrument on mercury (INC5), which takes places January 13-18, 2013, delegates from around the world will decide whether or not to pass a resolution restricting the use of Thimerosal in all vaccines. As it turns out, many of the Thimerosal-containing vaccines that have been banned from developed countries like the U.S. and Canada have been shuffled off onto developing nations in Africa, for instance, where there has been a huge upsurge in cases of autism and neurological damage. "Thimerosal, used as a preservative, is favored by the pharmaceutical industry because it is cheap and enables the industry to keep making vaccines in old and dirty factories," explained Dr. Mark Geier, M.D., Ph.D., to the African Delegation of the UN Treaty recently. "Sadly, Thimerosal also causes developmental problems, mental retardation and autism in mercury-sensitive children. Boys are more susceptible to mercury poisoning than girls, because testosterone amplifies the toxicity of this poison." Only an insane minority is still of the persuasion that Thimerosal belongs in any vaccines, as studies linking the chemical to autism, brain damage, and other conditions number in the hundreds (http://www.autismtreatmentclinics.com/Research.html). Nevertheless, it is still added to batch flu vaccinations, for instance, and in vaccines distributed to countries with fewer safety regulations as they pertain to childhood medicines. At the same time, momentum is building to once-and-for-all ban Thimerosal from medicines, period. And according to Bolen, a global ban on Thimerosal like the one being considered by the UN would very likely collapse not only the vaccine industry, but also the pharmaceutical industry, as over time the lawsuits filed by the parents of vaccine-injured children and their advocates would number too many to sustain. "If Thimerosal was removed from vaccines, worldwide, no doubt neurological issues in new children would nearly vanish for the next generations," writes Bolen. "The lawsuits against the industry, despite the existing laws, would never end. And those lawsuits wouldn't just be from individuals -- they'd be from whole countries, states, school districts, you name it. That would be the very blood end of the entire pharmaceutical industry -- probably forever."